Aga Khan Museum showcases best in Islam: Marmur 2015-01-04 | Ismaili.NET - Heritage F.I.E.L.D. Liberals in all three monotheistic religions are at the forefront of bridge-building, both with other faith communities and with the secular world. The rule formulated by the late Swedish-American theologian Krister Stendahl that I’ve cited before in this column helps us to understand the essence of interfaith and intercultural relations: always compare their best with your best, not their worst with your best. At a time when we often read reports of horrendous atrocities in different parts of the world committed by Muslims against “infidels” and other Muslims, it behooves us to recognize that such murderous excesses are aberrations of Islam, not its true manifestations. The new Aga Khan Museum in Toronto provides ample opportunities to see Islam at its best. Its promotional brochure states that the “unparalleled manuscripts, drawings, paintings, decorated ceramics, metalwork and architectural ornamentations” on display are “to inform, educate and inspire audiences about the arts of Muslims civilizations.” They do all that and much more. In addition to the permanent collection, there are temporary exhibitions of contemporary artistic creativity in the many countries where Muslims now live. The museum also arranges lectures and performing arts events that showcase past and present cultural achievements of Islam. The Aga Khan, after whom the museum is named as part of a larger centre, is the spiritual leader of the 15 million adherents of the Shia Ismaili branch of Islam in the world, some 20,000 of whom live in Canada. He’s a welcome guest in this country. Some time ago he was made an honorary citizen of Canada in appreciation of his lasting contribution to mutual respect and understanding between Muslims and other faiths and cultures all over the world. The Aga Khan Museum in Toronto provides ample opportunities to see Islam at its best, Dow Marmur writes. 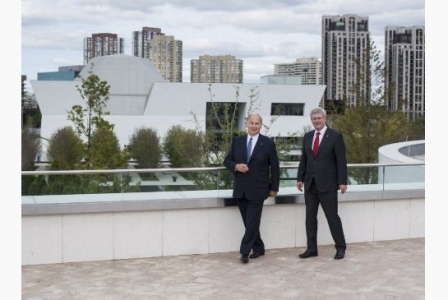 The Aga Khan, left, with Stephen Harper at the opening of the Ismaili Centre and the museum on Sept. 12, 2014. Ismailis are liberal Muslims and thus only a small minority. The majority is usually in the hands of powerful people, almost invariably men, who confuse and control their adherents by assuring them that they and they alone are the true heirs of their religious tradition. To deviate from it is regarded as infidelity and punished in countless, sometimes cruel, ways. The phenomenon exists in all three monotheistic religions. If it’s less in evidence in Judaism outside Israel, where Orthodox parties have political clout, it’s because there are relatively few Jews in the world, roughly the same number as Ismailis. But as a liberal Jew I’m persona non grata in virtually all Jewish Orthodox circles. I know of Orthodox Jews in this city who are forbidden to step inside the synagogue I had the honour to serve for many years. Yet it’s we liberals who are at the forefront of bridge-building, both with other faith communities and with the secular world. It’s also we liberal Jews who usually take the initiative of seeking common cause with Orthodox Jews who may despise what we stand for even when they share our objectives. We persevere because we know that our work is important, perhaps essential, for the well-being of the societies in which we live. We work on the assumption that Stendahl’s formula isn’t about numbers but about quality and purpose. The Ismailis are few in number compared to other Muslims in the world, but their contribution, together with the contribution of other liberal Muslims, toward our understanding of what authentic Islam is about is invaluable. The same is true of the contributions of liberal Christians and liberal Jews in Canada and elsewhere. Seen in this light, the Aga Khan Museum in Toronto promises to become a vital force, not because it represents the majority of Muslims but because it stands for what’s best in Islam. It is bound to grow in importance in years to come in our understanding of this great world religion. Non-Muslims have every reason to wish the museum success in its sacred endeavour. Dow Marmur is rabbi emeritus at Toronto's Holy Blossom Temple. His column appears every other week.